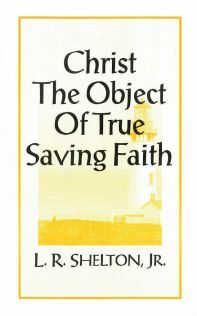 Pastor Shelton begins this booklet by showing us that we must put our faith in Christ alone. He looks at the nature of true saving faith which trusts in Christ and leans upon His character as surety of the new covenant, His willingness to save sinners, and His precious blood which will never lose its power. 1. We judge it necessary that a Day monthly be appointed particularly for Discipline, and not to manage such affairs on the Lord’s-day, which should be spent on the publick Worship of God, of a different nature: besides, such things may (on the account of Discipline) come before the Church which may not be expedient to be heard on the Lord’s-day, lest it disturb the Spirits of any Members, and hinder their Meditation in the Word which they have newly heard: tho in small Congregations perhaps a day in two or three Months may be sufficient. 2. The Power of the Keys, or to receive in and shut out of the Congregation, is committed unto the Church:53 The Political Power of Christ, saith Dr. Chauncy, is in the Church, whereby it is exercised in the Name of Christ, having all lawful Rule and Government within it self, which he thus proves, viz. 1. The Church essential is the first Subject of the Keys. 2. They must of necessity to their Preservation, purge themselves from all pernicious Members. 3. They have Power to organize themselves with Officers. Yet I humbly conceive I may add, that the Concurrence of the Presbytery is needful hereunto. 4. If need be that they call an Officer from without, or one of another Church, they must first admit him a Member, that they may ordain their Officer from among themselves. 5. They have Power to reject a scandalous Pastor from Office and Membership. There are many such yokes that well-intentioned people try to place on believers—telling us what we must do and not do or how we must live if we want to be pleasing to the Lord: “Don’t groom like that.” “Dress like this.” “Don’t drink that.” “Don’t drive (or ride) that,” etc. The same type of pressure was placed on first-century Christians. They were admonished to be circumcised, to keep certain Jewish customs and to maintain certain dietary restrictions in order to be holy. The questions raised by these pressures are what led to the Jerusalem Council of Acts 15. I am astonished to find that fame has become so inveterate a fabricator of untruths, for I assure you that I had no more idea of coming to Cambridge on Wednesday than of being dead last week. I have been, this week, to Tring, in Hertfordshire, on the border of Bucks. I have climbed the goodly hills, and seen the fair vale of Aylesbury below. In the morning, I startled the hare from her form, and at eve talked with the countless stars. I love the glades, and dells, the hills and vales, and I have had my fill of them. The week before, I was preaching at Ramsgate, and then tarried awhile at Margate, and came home by boat. Kent is indeed made to rejoice in her God, for in the parts I traversed, the harvest was luxuriant, and all seemed thankful. The Crystal Palace is likewise a favorite haunt of mine; I shall rejoice to take your arm one day, and survey its beauties with you. Now for the cause at New Park Street. We are getting on too fast. Our harvest is too rich for the barn. We have had one meeting to consider an enlargement, — quite unanimous, — meet again on Wednesday, and then a committee will be chosen immediately to provide larger accommodation. On Thursday evenings, people can scarcely find a vacant seat, — I should think not a dozen in the whole chapel. On Sabbath days the crowd is immense, and seat-holders cannot get into their seats; half-an hour before time, the aisles are a solid block, and many stand through the whole service, wedged in by their fellows, and prevented from escaping by the crowd outside, who seal up the doors, and fill the yard in front, and stand in throngs as far as the sound can reach. I refer mainly to the evening, although the morning is nearly the same. But now in Christ Jesus, you who sometimes were far off are made nigh by the blood of Christ (Ephesians 2:13). Jesus actually died at Calvary. In John 19:34, we read that one of the soldiers pierced His side with a spear and immediately blood and water came out. Christ Jesus really was dead! There, at the cross, Christ Jesus died that we might live. Also, by His blood, we come, not only into life but into communion with God. In the Greek, the word communion is “Koinonia”. It is a beautiful word that means, among other things, fellowship, association, community, communion, joint participation and intimacy. And this communion, this ‘Koinonia’ comes through the blood. But how do we come into contact with the blood? How do we obtain the benefits of His death? Romans 6:3 gives us the answer. It says, “…. that as many of us as were baptized into Christ Jesus, were baptized into His death?” When a person is baptized into the Lord’s death, it is there that he meets with the benefits and blessings purchased by the blood of Christ. But how then are the benefits of Christ’s death to become ours? How are we baptized into Christ? Here’s the answer. It is by faith alone! And where do we get this faith? It is the free gift of God. We can’t earn it or deserve it, we simply receive it! Have you trusted Christ alone to take away your sins and their legal consequences? If you have, you are already baptized into Christ. If you haven’t, then you still are carrying responsibility for every sin that you have ever committed. That means that when you die, there’s nothing left for you but the Judgment and the Lake of Fire. You may have been baptized in a church building, but if you are not trusting in Christ alone, you are not baptized into Christ. If you are not trusting in Christ alone, you are still in your sins. The shed blood of Christ is of no benefit to you! Why don’t you, right now, call on the Lord and ask him to save you? Why don’t you trust Him, right now, and receive Him and His salvation for yourself? Our God is wonderfully gracious. He will welcome you. Believe on the Lord Jesus Christ and you will be saved.